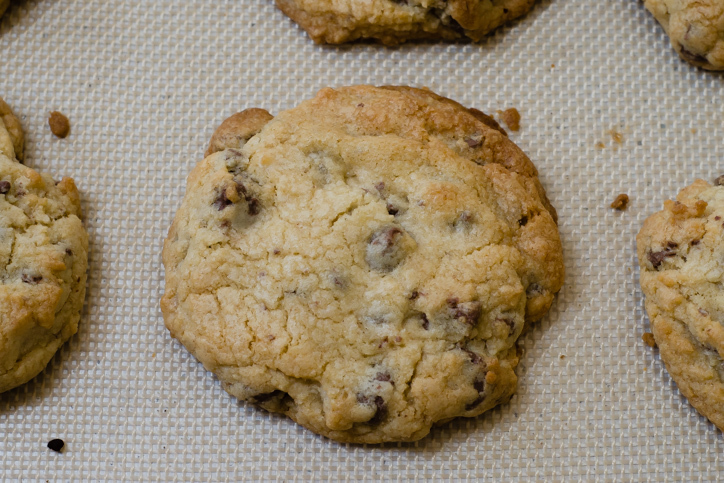 In my book, nothing tops the aroma and flavor of freshly baked chocolate chip cookies. In each bite, buttery, salty and chewy dough is broken up with sweet, dark smears of molten, drippy chocolate. The balance so perfect – like peanut butter-dipped pretzels or Oreos and milk – it’s impossible to eat just one. My kids have been begging me nonstop to bake them, and a few clicks on the Internet reveal everyone else is craving them too. The basic recipe involves flour, baking soda, salt, brown and white sugar, eggs, vanilla extract, and, of course, chocolate chips. Now comes the fun part: playing with the ingredients so the cookies turn out exactly as you like them. I’ve noticed among all the hundreds of variations on the original (Toll House Inn recipe, circa 1936), there are really only three types: chewy, crispy, or cake-y. 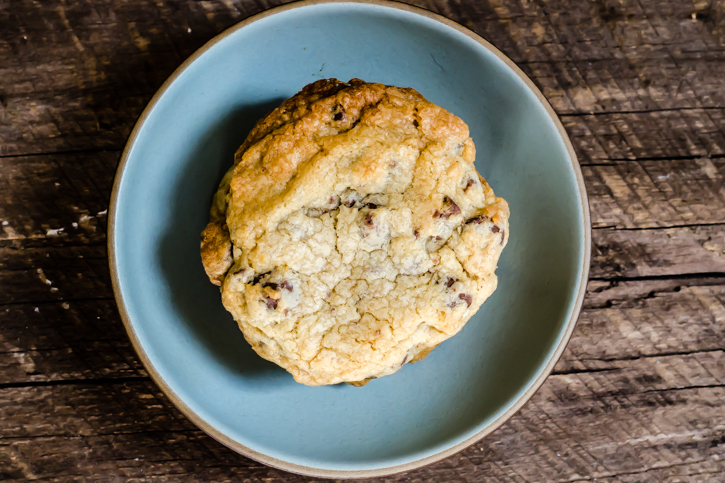 Cake shouldn’t be part of the cookie lexicon. Ever. As for chewy and crispy, I fall somewhere in between. I imagine the perfect cookie to be flat, crisp and golden brown around the outside, chewy on the inside. Ideally, the inner ring is just barely transitioning from pale to golden. It toes the line between raw and cooked, chewy and buttery, studded with molten chips. But not too many. 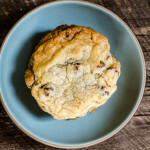 The chocolate to cookie ratio isn’t obscene – it’s not chocolate chunks barely swathed in dough – it’s more like a fun chocolate surprise in every buttery bite. 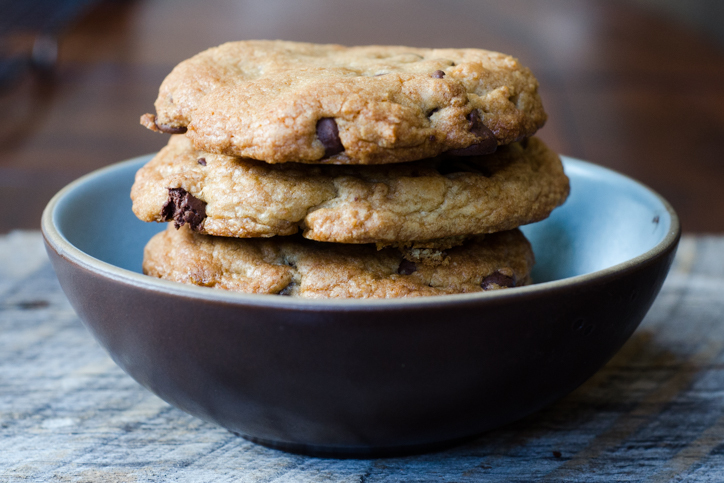 I hadn’t revisited my go-to recipe in so long that I started over, with two recipes – my tried and true Chocolate Chunk Cookie recipe from the Flour Cookbook and a Cook’s Illustrated recipe for Perfect Chocolate Chip Cookies that uses melted brown butter and dark brown sugar. I quickly knocked out the Cook’s Illustrated version. It was overly fussy and though browned butter sounded great, the flavor didn’t come through. The Flour cookie was great, as I knew it would be, but it uses bread flour AND all purpose flour. In an ideal world, you should to be able to bake these on a whim, in a moments notice, with ingredients you have on hand (if you don’t always have chocolate chips on hand, maybe you should). A chocolate chip cookie recipe calling for bread flour is the worst kind of unanticipated surprise. So, I removed the bread flour, even though it does produce a lovely chewy cookie, and increased the amount of light brown sugar to granulated sugar to replace some of the chew. I used one egg (because two eggs belong in cake batter), and I added a lot of butter, because it’s delicious, and because I hoped it would make the cookies spread out and crisp up on the edges. In a few of the batches, I also played with the chocolate chips. Regular supermarket semi-sweet chips (or super-sweet if we’re being accurate) are great, unfussy and remind me of my childhood. 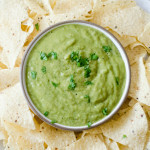 My kids loved the cookies with these chips best, and the potluck crowd probably would too. I thought they were a little flat and boring. Better yet were dark chocolate chips, preferably 60 to 70% cacao (or a bar of it chunked into 1-inch pieces). The dark, slightly bitter chocolate intensified the salty, sweet and buttery flavors– think sea-salted chocolate tart meets bake sale blondies – and the molten texture contrasted nicely with the chewy and crisp cookie. Serve these with a glass of warm milk, or a scoop of creamy, cold vanilla ice cream. I dare you to eat just one. These cookies are easy to bake, unfussy, and downright delicious. If you are the type who reads recipes well in advance of baking, set out the butter and eggs a few hours before assembling the dough, to bring them up to room temperature. You should be able to fit 12 cookies per sheet tray, 18 to 22 cookies total. I use 2 to 3 heaping tablespoons of dough per cookie. Before baking, press down lightly on the dough balls with your fingertips - it jump-starts the spreading out process to ensure crisp edges. 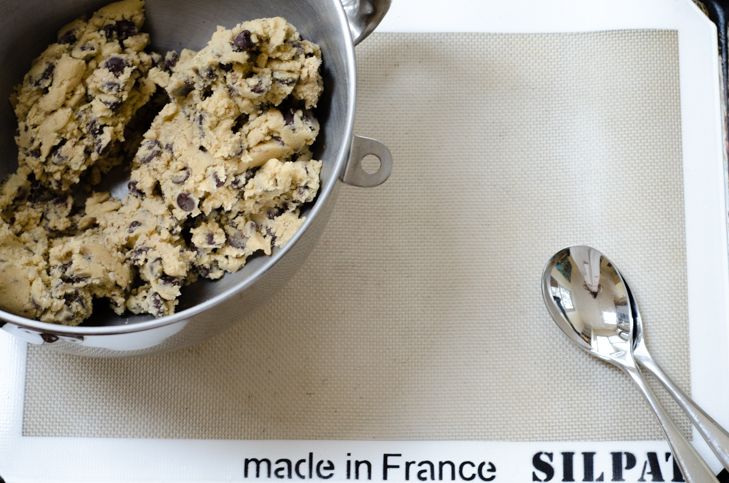 Resist the urge to bake more than one tray at a time - trust me - they're better this way. The cookies can be baked immediately, or stored up to 3 days in the refrigerator. The flavor and texture of the cookie is better if the dough sits for a few hours in the refrigerator but no one will notice the difference if you bake them right away. Or, shape them into balls and freeze in a tightly-lidded container for up to a month. Preheat the oven to 375 degrees, or, if using the convection setting, 350 degrees. Combine the sugars and butter in the bowl of a stand mixer fitted with the paddle attachment. 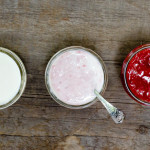 Beat on medium-high speed for about five minutes until the mixture becomes lighter in color and fluffy, stopping once or twice to scrape down the sides and bottom of the bowl with a spatula. (If using a hand mixer, this will take about 8 minutes). Add the egg and vanilla extract on medium speed, mixing until fully incorporated. Reduce the speed to low and add the flour in three additions, mixing each time until fully incorporated. 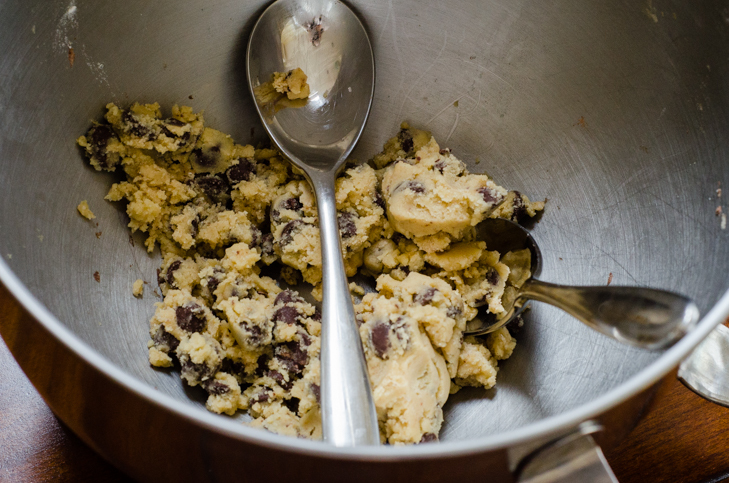 Scrape down the sides of the bowl and, on the lowest speed, add the chocolate chips. At this point, you can remove the dough to a tightly-fitted container and refrigerate for at least an hour or up to two days (for optimal flavor), or shape into balls and freeze. 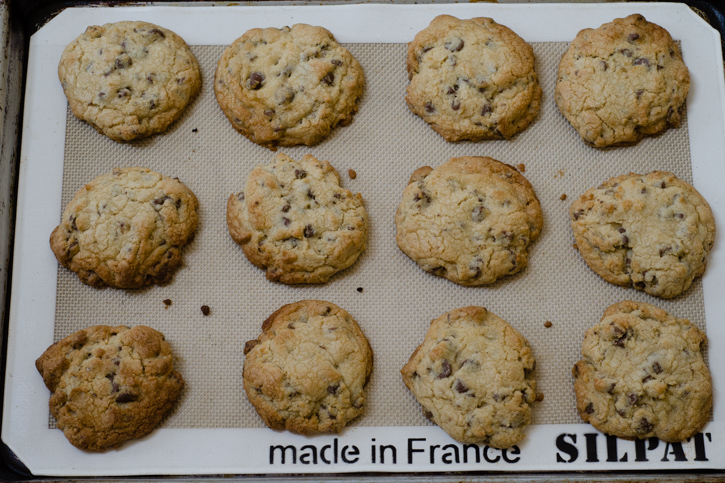 Or, bake immediately: Scoop a scant ¼ cup of dough and place on a sheet tray (three across, evenly spaced). 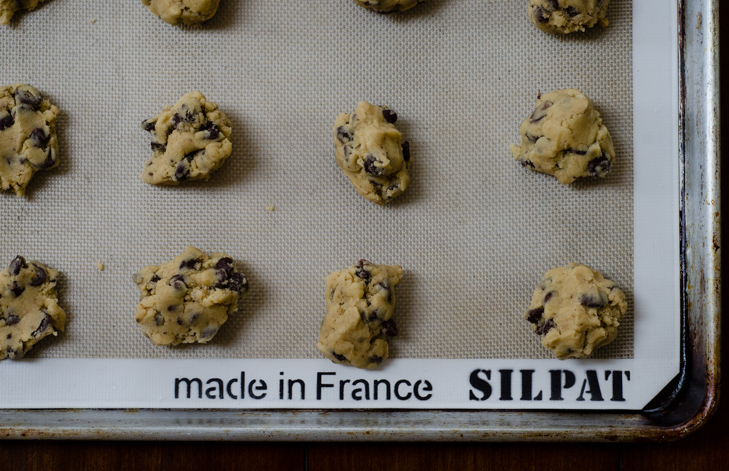 You don’t need to use spray or parchment – I use a silpat liner only because my sheet trays are old and messy. Repeat until you have four vertical lines and three across, or twelve cookies total. Lightly smoosh the balls of dough with your finger tips and bake on the top rack of the oven (about 12 inches from the top). Set the timer for five minutes, rotate the pan 180 degrees, and begin checking for doneness after 4 more minutes. They should bake between 9 and 10 minutes total, and the cookies should be crisp and golden brown on the outside, but still mostly pale in the center. Allow the cookies to rest on the sheet tray for five minutes, and then remove to a cooling rack. Serve warm, or let cool and store in a tightly lidded container for up to 3 days. Warm in a toaster oven at 350 degrees for a few minutes before serving, if desired. Delicious, and the darker chocolate is soooo perfect. 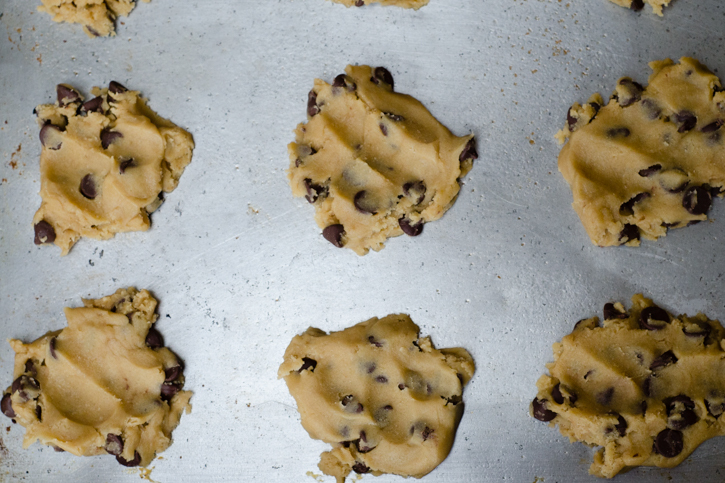 If you want to be obsessive try reserving a few chocolate chips to place 3 to 5 on top of each cookie before baking. They would then resemble “Grammy Evie’s” – ah the days of Betty Crocker and baking to please your man.